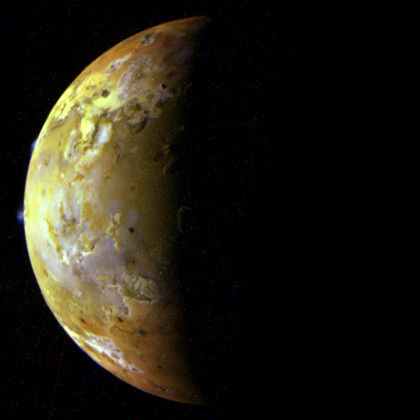 The New Horizons team has released this color image from the Multispectral Visible Imaging Camera (MVIC) as part of their commemoration of the one-year anniversary of the spacecraft's encounter with Jupiter. 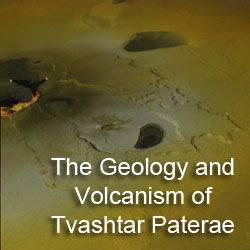 The lefthand frame reveals the red ring around Tvashtar Paterae, the result of sulfurous fallout from the volcano's large plume. 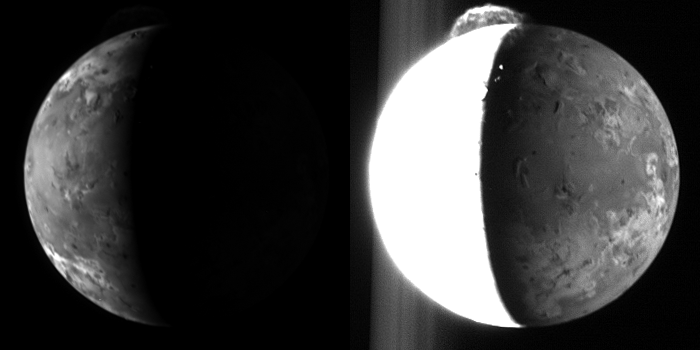 The right frame is the same image, but stretched to better show the Tvashtar and Prometheus plumes (near the equator along the limb). These plumes appear blue due to small, smoke-sized particles in the plume. The right frame also shows the some of the terrain illuminated by Jupiter as well as a hint of the incandescent lava in the Tvashtar fire fountain. 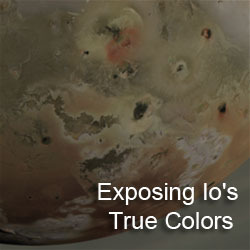 The color presented here is only approximately true color. 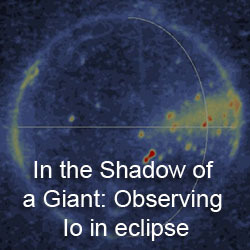 Two filters were used to create this image: a blue filter with a central wavelength of 475 nm and a methane filter with a central wavelength of 889 nm in the near-infrared. So you are seeing colors a little redder and less yellowish than what you would see with the naked eye. For comparison, there is a nice Galileo frame from November 1997 that has a similar geometry. As another comparison, I've put together a couple of the LORRI frames taken at nearly the same time as this MVIC image: one exposed to show the area illuminated by the Sun (and the lava fountain at Tvashtar) and another exposed to show the Tvashtar plume and the area illuminated by Jupiter.